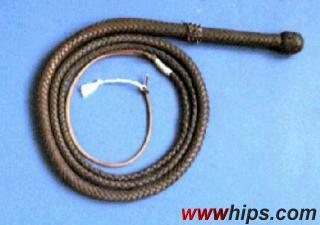 Latigo bullwhip made by manufacturer Fleck (Germany), 8ft/12plait, said to come from a German circus. This whip has been used a lot and also had to take some abuse (one damage by horsestep!). Because it was treated with oil (ugh! ), the thong became very supple. After treating with a good leather fat and a fall replacement, the whip is now in good condition again.